Cal Orey is a freelance author-journalist who holds both a bachelor's degree and master's degree in English (Creative Writing) from San Francisco State University. Over the past twenty years she has written ten books and several articles for national and international magazines and websites. She recently released a new book entitled, The Healing Powers of Chocolate. The internationally known "shake and bake" author is highly praised for her reader-friendly health related books that reveal her passion for sharing down-to-earth healing information. B2M proudly presents our exclusive interview with Cal Orey. CAL: At the age of 8 my first poem “School Days” was published in the school newspaper. My teachers told me I had a “gift.” And in the fifth grade my autobiography was read in front of the class by the teacher. My life was the typical fifties Father Knows Best style, but I used my imagination to make it stand out. B2M: The Healing Powers of Vinegar was the first book you penned. What sparked your interest in writing this particular book? CAL: An editorial consultant gave me a choice: vinegar or ghostwrite a book for a cardiologist. I chose vinegar because I love to write solo. The consultant told me the book would have a long shelf life. He was spot on. More than a decade later, my vinegar book is now available in 2nd edition, 13th printing, and is the leader of the “Healing Powers” series. B2M: In writing your most recent book, The Healing Powers of Chocolate, what was the most interesting fact you discovered about this decadent treat? CAL: Chocolate—the dark stuff, at least 60% cocoa content—is not only a mood enhancer due to its amazing compounds, but its antioxidants are shown by studies to help lower the risk of developing cancer, heart disease, and obesity. Thus, that means you can live a happier, longer quality life. B2M: All of your books thus far, have contained a nature-based element, from earthquakes, health, animals, and relationships to spiritual growth. What other subject matters are you interested in writing about? CAL: I have this craving to pen books for kids. The topic matter would be about wildlife, living life to the fullest, and coping with challenges. I feel I touched on this in my co-authored book, The Sky is Falling and 202 Pets’ Peeves. In these books, I am the spokesperson for dogs and cats—and two whales. Because of my intuitive powers (I’ve been doing phone psychic work as well as have been on national radio for my earthquake predictions and hits) I can tune into two-leggers and four-leggers. B2M: Do you have a favorite among the ten books you've written? CAL: I’d choose The Man Who Predicts Earthquakes and The Healing Powers of Chocolate. Since I’m a quake chaser and a chocolatarian, these two choices rock my world. CAL: I prefer the classic masters, including John Steinbeck and Jack London. 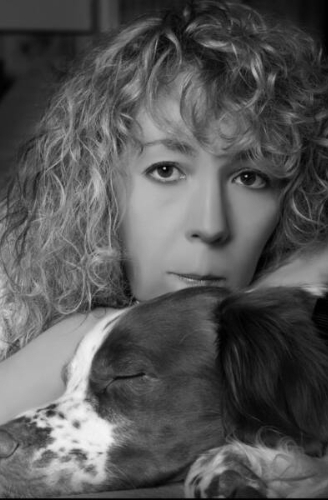 I’ve written articles on both these authors—their works and their love for canines. Both men had a love for the outdoors and compassion for good people and great animals—I can relate. CAL: I feel I’m getting closer to writing fiction—what I was trained to do in graduate school. However, it’s non-fiction that seems to have a hold on me. I predict in the future I’ll compromise and write a creative non-fiction book on my intuitive work. B2M: Outside of writing, what are your other interest? CAL: I love to hang out with my two Brittanys, Simon and Seth and black cat Kerouac. I’m a film buff. Also, I love to cook and bake. In fact, I now write a weekly column “What’s Cookin’ at Callie’s Cabin” for the Tahoe Daily Tribune. CAL: I swim infinite laps at one of the resort pools (I live at Lake Tahoe). I believe I must have been a mermaid in my past life. And, I pray there is an infinity pool (and dogs) in heaven. Read: I’m Catholic. CAL: Currently, I’m working on a new book for the “Healing Powers” series. It’s a surprise super food—and naturally, very close to nature. I’m having fun till the book is out the door in the fall, my favorite season. B2M: Cal we encourage you to continue writing books that are health conscious and nature based. Providing interesting facts to empower readers. We look forward to hearing more from you.